When your building needs specialty drying services you can depend on SERVPRO of Des Moines SW and East to have the systems needed to help when you need it most. We have specialty floor drying systems to dry hard wood floors. This picture shows a hard wood floor drying system for a gym floor. Gym floors can cost a significant amount of money to replace. When they are affected by water damage the faster the water can be extracted and specialty drying equipment can be installed the better. Wood can easily warp and separate. This system uses tubes to pipe the warm dry air under the floor and exhaust the moist air back out. We also have another type of system were we can install mats on top of the hard wood flooring system. Depending on the infiltration, the type of wood flooring and the type of install we decide on the best course of action to treat the situation. When fire damage affects your home or business SERVPRO of Des Moines SW & East is here to help. We have IICRC trained technicians that specialize in structure and content cleaning. One of the first processes in structure cleaning is to remove soot residue. We use dry sponges to remove the soot from the affected materials. 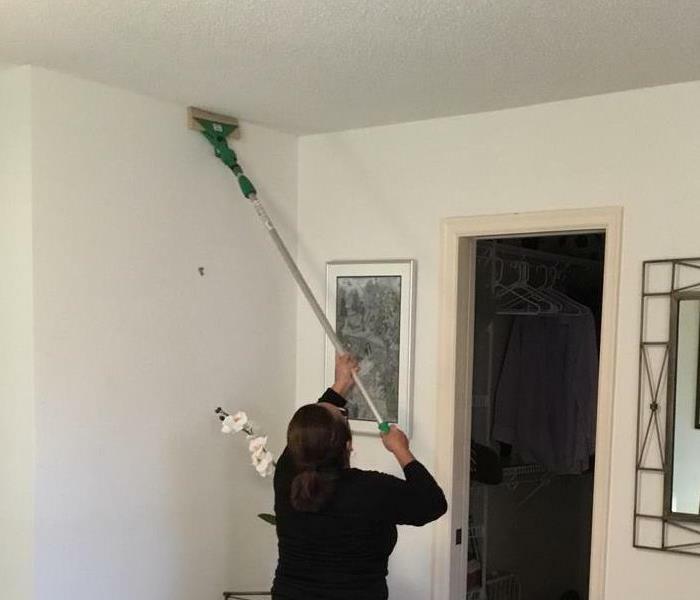 In order to reach the high areas in the home we will attach the dry sponge to an extendable pole to reach. Then the sponge can be used to wipe down ceilings and walls of any soot that might be on the structure. Soot residue has to be removed in order for the structure seal coat to stick. You can depend on SERVPRO to have the right training and tools to get the job done. When fire damage occurs there are different techniques of cleaning depending on the type of fire that occurred. You can depend on SERVPRO of Des Moines SW & East to help your business or home after the fire has occurred. We will scope the situation and determine the best plan of action. There are different techniques. One of those techniques and processes is wet washing. This process is not to be used for every fire as it can smear the soot verses remove it. The picture shows our team wet washing a section of soot damaged area and the improvement it has made on this particular fire. We are here to help when you need us most. If you have had a fire in your home or business give our team of professionals a call. It is the water that you don't see that can cause damage. SERVPRO of Des Moines SW and East uses some of the best meters, detectors, and monitoring devices on the market to protect your home or business when water damage occurs. To make sure that the structure is dry and proper moisture progression is taking place we use these tools when drying a structure. We do daily monitoring while drying a structure as well as will provide moisture checks for residences and commercial locations that have had water infiltration to make sure that the structure is dry and there is not water hiding behind structural materials. This picture shows a infrared camera, called a, FLIR camera. This camera is showing where there is water still trapped in below the flooring material. When you have water damage you can depend on SERVPRO to have the right tools to make sure your structure is properly dry. When you have hard wood floor damaged by water you can depend on SERVPRO of Des Moines SW to have the specialty drying systems needed to be able to help possibly restore your flooring. Hard wood floor drying systems include mats, air movers, and dehumidification equipment to be able to remove the water trapped by the flooring. The trick to being able to save the flooring is speed. Quick extraction of standing water and quick setting of the floor system is key. If too much warping of the wood has taken place it is hard to bring the wood back to its original state. When water damage occurs to any hard wood flooring it is best to call SERVPRO and have them do a moisture check of the floor and make sure the flooring is dry and there is not any unwanted moisture trapped under the floor to prevent further damage days later. SERVPRO has the equipment for residential losses or even large commercial wood floors like those that are installed in gymnasiums. SERVPRO of Des Moines SW's General Manager, Billy, knows how to turn up the heat. We enjoy cooking and thanking those that refer clients to us. When water or fire damage affects a clients home it can be a devastating experience. We have built fantastic relationships with wonderful insurance companies, realtors, fire departments, property managers, and others that will refer their friends to us when damage happens. They put their trust in us to take care of them when it matters most. We thank those that refer work to us by providing lunch. We know that they appreciate our trained staff quickly and efficiently taking care of their friends and we appreciate them for referring the work to us. We love to get behind this large grill and cook up some great food. SERVPRO of Des Moines SW has a cleaning product for any cleaning situation. Weather you have a sewage job, a fire job, a mold job, a carpet cleaning job, a job that might have some blood, or a job that has graffiti. We have a product specialty formulated by our scientists at SERVPRO that will be able to help remove that stubborn situation. We are here as your premier cleaning company to make it "Like it never even happened." 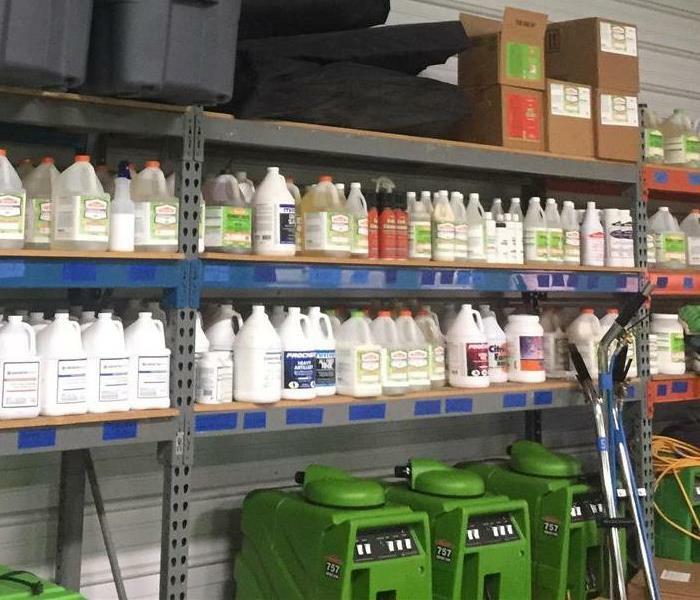 We have products stocked and ready on our shelves all the time and our trained technicians know how to safely and properly use these resources to treat the most stubborn of situations. We have environmentally friendly "green" products as well. We have deodorizes and air fresheners also. You can depend on SERVPRO to take care of you, your home, business, carpets, upholsteries, etc. Give us a call today with your stubborn cleaning needs. When your business or home are affected by water damage and you don't know what to do you can trust that SERVPRO of Des Moines SW has the equipment necessary to provide the mitigation services you need. 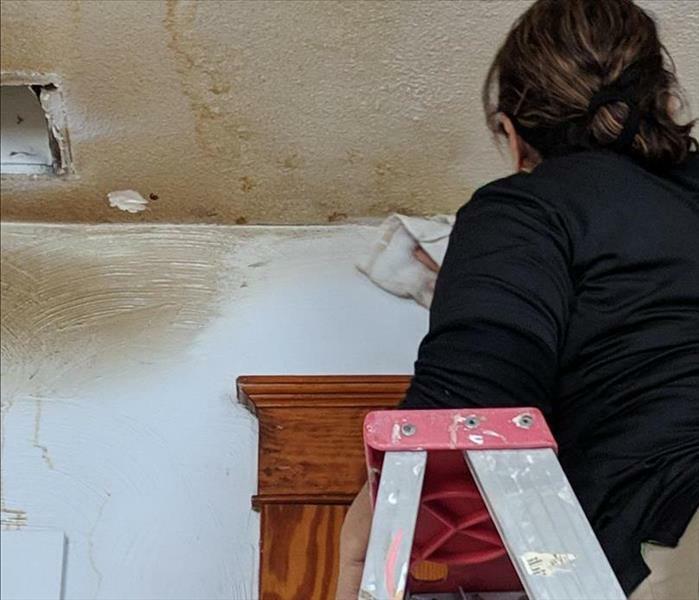 When you find water damage call our office right away and we will be out to provide a plan of action and start providing services to stabilize the structure to minimize any further damage from occurring. A big part of properly mitigating a water damage is air flow and providing the right amount of air flow for the affected square footage. With our trained technicians taking measurements and assessing the situation this is figured out. We can then provide the right amount of equipment to properly mitigate the situation. This picture shows a few different types of air movers we have on the same job and how we affectively space them to provide airflow to affected materials. The metal silver fan in the front corner is the clients on this job. You can see the difference on this job of what was actually needed for air flow.